02 | May | 2016 | GameXcess.net - Gaming News, Videos and Editorials! I know I announced earlier today that Nintendo and The Pokémon Company were distributing the lengendary GEN 4 Pokémon Darkrai this month with some help from GameStop, but apparently those aren’t the only legendary Pokémon you can get for free this month. Starting today, you’ll be able to obtain a Level 100 Zygarde, who you may remember from Pokémon X and Pokémon Y, for free through the Mystery Gift menu. Zygarde is being distributed from May 2nd, 2016 until May 8th, so get it right now! After Zygarde is no longer being distributed online, another will take its place. Starting May 11th, 2016 Nintendo will be distributing the legendary Pokémon Xerneas, which you may remember from Pokémon X, in its shiny form! That can be downloaded from the Nintendo Network between May 11th, 2016 and May 17th, 2016. Finally, from May 20th, 2016 to May 26th, 2016, you’ll be able to download a shiny Yveltal, which you may remember from Pokémon Y, off the Nintendo Network. These three Pokémon can be obtained through any GEN 6 game, that means that you can get them on Pokémon X, Pokémon Y, Pokémon Omega Ruby and Pokémon Alpha Sapphire. Just restart your game, and set your game to recieve a gift from the Internet. Just make sure to save your game after you get the Pokémon from a Pokémon Center’s Mail Lady. In a whole new type of Let’s Play for this website, Maniac is joined by his good friend Twitch as they play the first hour of the independent game Gone Home. Maniac has never played Gone Home before, but he had heard good things about it. Twitch had played Gone Home on the Mac and did not enjoy it. So, how will these two men handle playing this game together on the PS4? Let’s find out! Gone Home is out now for PC, Mac, PS4 and Xbox One. Attention all Pokémon Trainers living in the US. 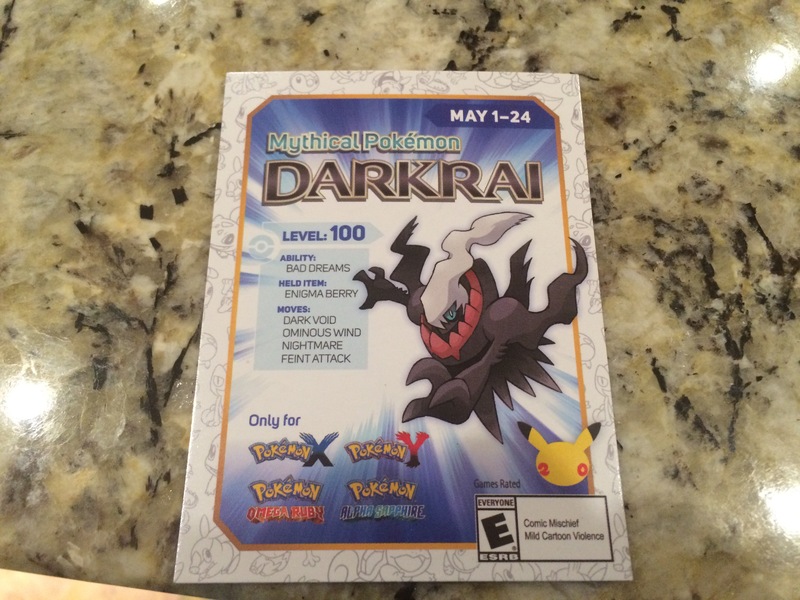 GameStop has confirmed they have begun distributing codes for the mythical Pokèmon Darkrai. You can obtain a code by going into any GameStop location between now and May 24th and asking for one. If the store still has them in stock, it will be given to you free of charge. From there you can redeem the code from your game’s Mystery Gift menu. Take a look and see for yourselves how powerful this Pokémon is. The gift codes work on any copy of Pokémon X, Pokémon Y, Pokémon Omega Ruby or Pokémon Alpha Sapphire. Just make sure your game and system are connected to the Internet and updated to their latest version before attempting to redeem them. If you don’t have access to a WiFi connection to redeem your code, I recommend checking out a place with a Nintendo Zone hotspot. Usually you’ll find free WiFi for your Nintendo handheld in McDonald’s, Best Buy and Barnes and Noble locations across the US. The codes only work once, so make sure to redeem it on the specific game you need it most! You must redeem your code before August 31st, 2016. Next month, Nintendo will be distributing the Mythical Pokémon Manaphy through the Nintendo Network, and that means no codes will be needed to get it! Pokémon X, Pokémon Y, Pokémon Omega Ruby and Pokèmon Alpha Sapphire are out now exclusively for Nintendo 3DS systems.